Highland seniors (l-r) Morgan Wilhelm, Liz Jensen, Mack Anglin and Caitlyn Karney signed their letters of intent to compete athletically in college last Wednesday. Anglin will play baseball, while Wilhelm, Jensen and Carney all will play softball. 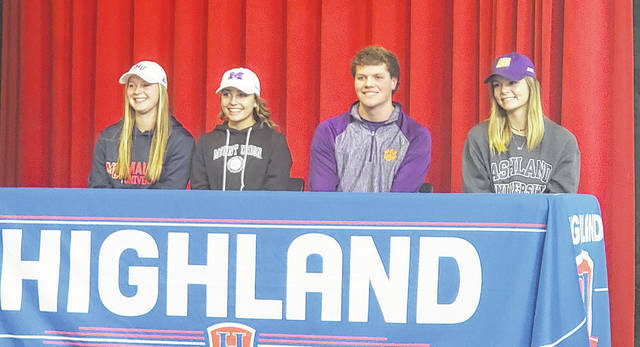 Four Highland seniors signed their letters of intent to play baseball or softball in college last Wednesday during an afternoon ceremony. Mack Anglin signed to play baseball for Clemson University, while three members of the team’s softball team also announced their commitments. Kaitlyn Carney will move on to Ashland University, while Morgan Wilhelm will play at Malone University and Liz Jensen will continue her academic and athletic careers at the University of Mount Union. For Anglin, officially committing to Clemson was a formality, as he’d been verbally committed to the ACC power since after his sophomore year. Anglin, who will major in education or criminal justice, noted that he’d gotten a lot of attention in recruiting after that sophomore season. Anglin added that while he’ll likely focus on pitching in college, he’s open to doing anything that will help the team. He also commented on looking forward to playing in front of the large fan-base the Tigers have. Carney was both excited about the softball team at Ashland and the program in her planned major. While with Ashland, Carney expects to continue playing in the outfield, but adds that her main concern is simply helping the team however she can. If there’s one thing the Scot senior isn’t looking forward to, it’s simply not being able to play with her current teammates after this year. Jensen, Wilhelm and her all commented on how good of friends they are and how it’ll be an adjustment to not be teammates after the upcoming spring season. One thing she is excited for is all that she can learn over the course of her college years. Both of Wilhelm’s parents attended Malone, but that actually didn’t play a role in her choosing the same school. “At first, I really didn’t want to go because my parents went there, but when I visited the campus, I fell in love,” she said. Being able to commit to college along with Carney and Jensen made the moment even more special for her. Wilhelm plans to major in exercise science and physical therapy at Malone. As a member of the softball team, she feels she can bring a lot to the program. Being able to continue playing softball after high school is very exciting to her. Jensen started looking at Mount Union as her future college early this year and found the school to her liking. Jensen said that Mount Union became interested in her after seeing her in a camp hosted by Kent State. Like her teammates, Jensen was excited to sign her commitment. She added that before going to college, she and her teammates have high hopes for this spring.